Last week, the Southeast U.S. saw possibly the most devastating storm of the year for the region. States including Alabama, Mississippi, and Tennessee were all hit by the worst of it. As a result support has been pouring in, and Google has even updated their imagery in Google Earth to reflect the damage. 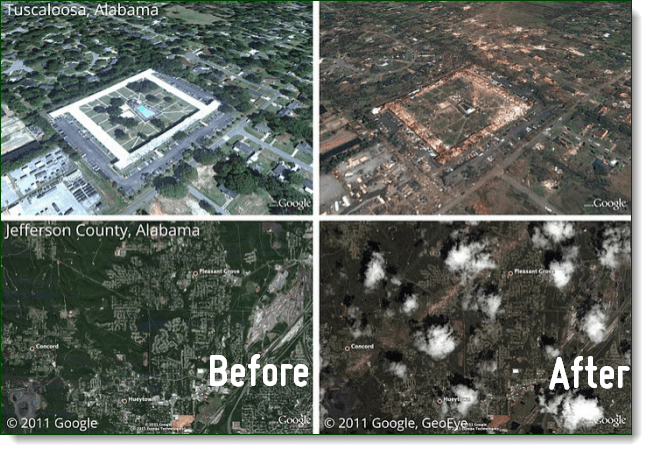 If you don’t have Google Earth installed, you can just view Google’s Picasa web album for the “before and after” photos. The sheer power of some of these tornadoes is truly incredible. Roofs were ripped clean off of buildings, and entire trees were uprooted only to be tossed about. According to ABC, the storm had at least 300 casualties with most of them near Tuscaloosa, Alabama. You can see via the Google’s imagery the massive scar that each tornado left across the land in the path it traveled. YouTube has multiple videos uploaded of the event, including captured footage of the actual tornadoes. At the time and currently I’m in the Washington D.C. area, out of harms way, but I still felt the high speed winds and extremely heavy rainfall. Check out the full “before and after” photo album via Google.